Happy Halloween! When I was a kid, this was the Superbowl of holidays. Mostly because I was able to be someone else for a day. And spend tons of time planning who this new me was going to be. * “Bad” Sandy from Grease? Cleopatra? Cyndi Lauper? And what were the details that were going to make it clear to others who the new Me was that day? These were the things I fixated on until the Day of Transformation…Halloween. Gosh, I loved it, even when I got the dreaded apple with a coin in it for a treat, or somehow felt bested by someone else’s more inventive costume. 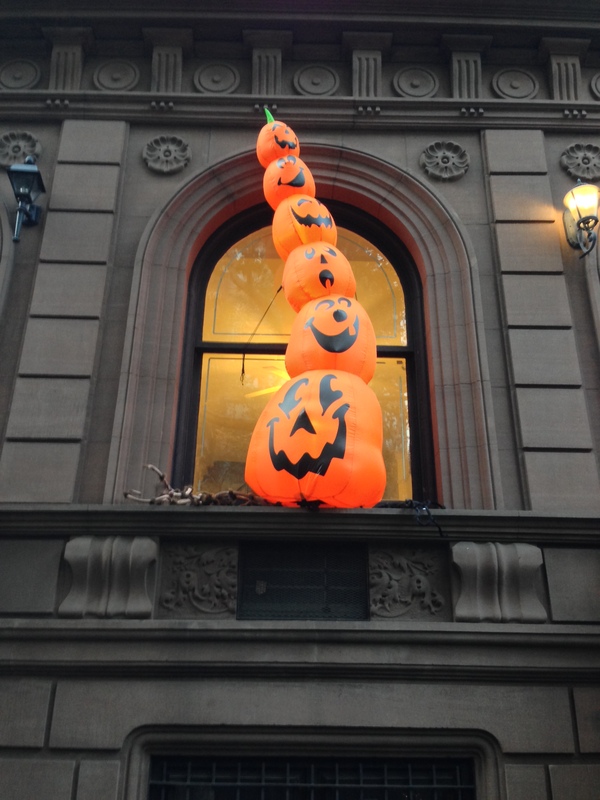 It is funny that the things I tend to like about Halloween now are more about witty jack-o-lanterns and things like this most excellent and insane pumpkin decoration (above) that I saw while walking around the Upper West Side last week. I don’t know…they are all just so happy and full of whimsey. And the notion of becoming someone else on a specific day seems, well, unnecessary. I am who I am, and that is always changing as time and life requires, so I guess I no longer see the fun in doing it for a day. But slowly transforming yourself over days and weeks and years into the (better?) person you’d like to be…that does seem fun. So, I guess I’ll just stick to candy corn and pumpkins for today. Enjoy whether you are being you or someone else this Halloween! *Props to my Mom for being game on the costume front. Really…there was nothing she would not make for me. And I asked for some pretty crazy stuff. You are currently reading A Day of Transformation…or at least Pumpkins at Some Cozy Night.